The title character, drawn by Jim Davis. Jim Davis is known for creating the very famous comic strip Garfield, which started in 1978, which has become a massive media franchise on its own, adapted into animated series, video games, TV specials and feature movies. What is lesser known, however, is that before Garfield, Jim Davis created another comic strip called Gnorm Gnat, which ran from 1972 to 1977, which featured anthropomorphic insects. The main character was the titular Gnorm Gnart, a "straight man" with "Walter Mitty" tendencies. Other characters include a depressed fly, Freddy, who only has a week to live, and an unspecified species "free spirit, just a tad insane" bug called Lyman (the Garfield comic strip would also have a major character called Lyman, Odie's original owner, who would infamously disappear without a reason). The comic strip was only published weekly in The Pendleton Times, a newspaper from the town of Pendleton in the State of Indiana. Davis tried to have it published in more mainstream publications, but it kept being rejected. Although his art and writing were praised, the main criticism he received was that the characters were considered "unrelatable" and "unfunny" due to being insects. Davis then decided to end the strip, having the titular protagonist die by being stepped on by the foot of a human. He would then decide to have his new comic strip be about a more relatable animal: a cat, Garfield. The rest is history. Despite being the predecessor to one of the most popular comic strips of all time, almost no strips of the original comic have resurfaced publically, and it seems Davis and his editors have no interest into collecting and reprinting them. Only a few comic strips have been shown in Garfield celebration books. The rest, including the infamous last strip, remains in the dark. According to an author of fan-produced parody website Square Root of Minus Garfield, some scans of Gnorm Gnat still exist at the "local library" in Pendleton, Indiana, on "microfiche films". He was able to look at some unknown strips, notably one (from 1975) where the script was reused for a 1982 Garfield strip. 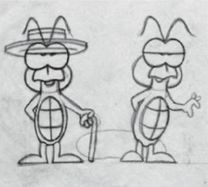 Original pencil sketches of Gnorm, from around 1973. One of the strips reprinted in a Garfield celebration book.